And the rabbits have plenty to eat." Such a lawn will surely have clover in it. Lean in and let me tell you a secret about my lawn. I bought a bag of seeds for dutch white clover and sowed the seeds around my back lawn earlier in the spring. I'm not sure how well I timed my sowing but as I mow now I see little spots of clover coming up all over. Some of the clover seed must have germinated. I'd like to convince others to add clover back into their lawns. I truly think we lost our way, lost our minds, lost our sense of what's important in the garden and in life when we let the lawn care companies and services convince us that clover should be killed off with herbicides. I think there are many angles to use to help people find their way back to lawns with clover in them. We could appeal to the feelings of nostalgia we often get when we see something from the past. Did you know that prior to the mid 20th century, clover seed was actually included with grass seed mixes? I have proof in the form of a 1931 Department of Agriculture Farmer's Bulletin on lawn care. They recommended 17 parts of bluegrass, 2 parts of redtop (another type of grass), and 1 part clover for the ideal lawn. We could tug at the inner child in all of us, and remind people of a time when kids spent hours looking for four-leaf clovers or picked clover flowers to tie together to make bracelets, necklaces, even crowns. Sometimes, when I was a kid, we just tied the clover flowers together to see how long of a flower chain we could make. Kids can't do that without clover in the lawn. 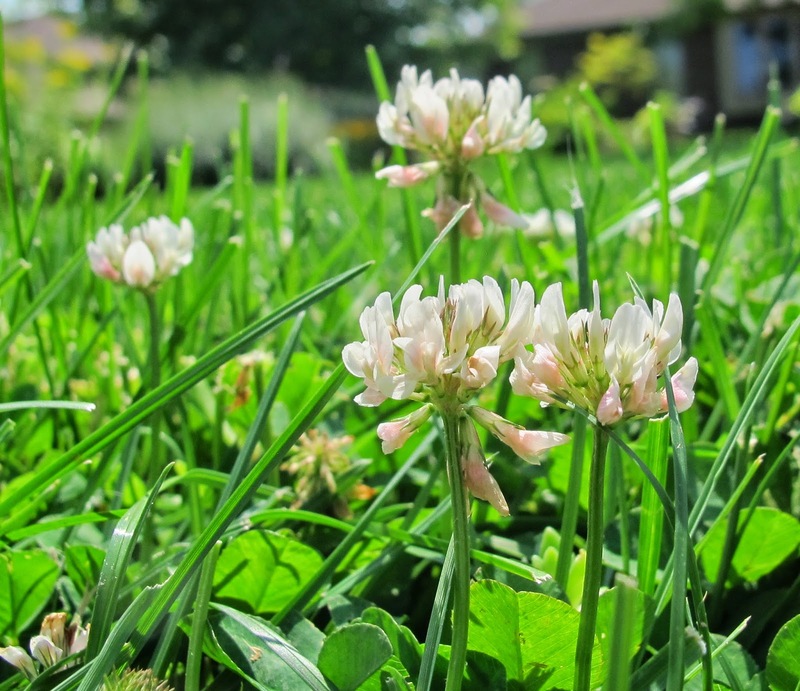 Some people might be convinced to add a bit of clover to their lawn once they find out clover is in the legume family, so it fixes nitrogen in the soil. This nitrogen then helps the rest of the lawn grow better, without lots of additional, costly, fertilizer. Yet another reason to grow clover in your lawn is to give the wild rabbits something to eat besides the vegetable garden. Though I have no scientific proof, I have anecdotal evidence that once I allowed clover to grow in my back lawn, the rabbits seemed to eat less in my garden. And before I forget, I've noticed clover is much more tolerant of drought or near drought conditions, staying green longer than the actual grass in the lawn. Of course, you can't blast your lawn with a pre-emergent herbicide in the spring and then sow clover seed. The seed won't germinate. Nor can you soak your lawn with a broadleaf herbicide. It will kill off the clover. You also can't expect your lawn to be weed free when you grow clover in it. You'll have a few dandelions, some plantain, maybe even, if you are lucky, wild violets. But you'll also have a place where children and the young at heart can sit for hours looking for four-leaf clovers without exposing themselves to herbicides. Oh give me a lawn with clover, for all the reasons or any of the reasons above. Very good read and thanks for the reminder. When I see all the weeds and moss (from lots of shade) I feel like it's a disaster. It's nice to know that I'm not the only one with clover and weeds!